Christie a black doll is Barbie dolls friend and Brad's girlfriend, she's 11 1/2" tall and can share Barbie's wardrobe, as only her original clothing was made for her. Doll markings and full descriptions are noted below. 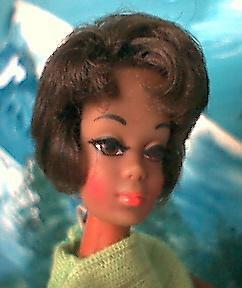 The other vintage Barbie friend black dolls are Julia and Cara. Rooted eyelashes, short curly brown hair, brown eyes, black doll with bendable legs, pull string talker. Dressed in knit green top, rose vinyl shorts, clear X stand and a clear box. Marks: © 1967 Mattel, Inc. U.S. & Foreign Pats. Pend. Mexico. Same as in 1968 but hair can turn red, new cardboard box, with window, same marks as above doll. New wild print cover up (matches boyfriend Brad's swimsuit top which is shown), two piece orange swimsuit, clear X stand. Same marks as above doll. Modified hair style and has a darker skin tone, all else same. New Mark: © 1967 Mattel, Inc. U.S. & Foreign Pats. Pend. Hong Kong. (Note: Has same markings as 1971-1972 Talking Julia doll). 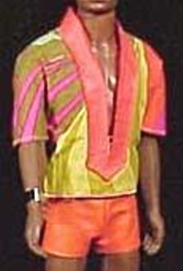 Rooted eyelashes, brown curly hair, side part, lighter brown skin, black doll with bendable knees, one piece hot pink and yellow swimsuit (USA version shown on left) and clear x stand. Marks: © 1966 Mattel, Inc. U.S. Patented U.S. Pat. Pend. Made in Japan. 1119 Christie Doll Twist N' Turn shown above is the European version in her lime green and yellow original swimsuit. Midge head mold, long straight black hair, rooted eyelashes, rust colored eyes, black doll dressed in a two piece purple, orange print, fringed outfit, purple shoes, orange headband. Marks: © 1968 Mattel, Inc. U.S. & Foreign Patented Patented in Canada 1967 Other Patents Pending Taiwan. Painted eyelashes, long straight black hair, black doll with bend knees, twist waist, one piece red swimsuit. Marks: © 1966 Mattel, Inc. U.S. & Foreign Patented Other Pat's. Pending Made in Taiwan. New yellow swimsuit, white box, rest same as above. New marking. Marks: © 1966 Mattel, Inc. U.S. Patented U.S. Pat. Pend. Made in Korea. In 1976 a new rose box, rest same as prior years.